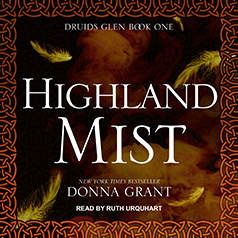 Donna Grant presents the first novel in the Druids Glen series. An honorable laird . . .
Conall MacInnes was born to a clan that for centuries has been charged with the guarding of the sacred Druids. It's a duty he has always met with a willing heart, until the day his sister, a Druid priestess, goes missing and the very Druids he has protected refuse to help him find the last remaining member of his family. Then a three-hundred-year-old prophecy places a Druid in his hands for safekeeping. It's the chance at revenge he's been waiting for, but is he willing to pay the cost his revenge will demand—the loss of his mate and the future of Scotland? A willing lass . . .
Glenna MacNeil wants only to be free, to find the purpose of her life. When she is told to look for the dark laird who would free her, she eagerly goes with the powerful Highlander who fights her clan, not realizing she has set in motion events that will change the course of history.